I have always been an avid fan of stuffed animals. I have my teddy bear from when I was a child, always bought them for my own children and now that my grandchildren are here they have several as well. I believe that is why I love Stompeez so much. Not only are they adorable animals but very useful as well. These Illinois weathers are not always the tamest and well whenever we can have fun wearing something on our feet all the better. animated slippers skyrocketed in popularity last year during the holidays, thanks to the soft, playful characters kids wear on their feet for stomping fun. And while popularity is a good thing, it also overwhelmed the brand, which at that time was new. 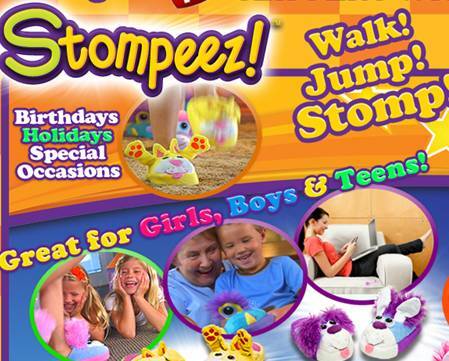 Now under new management, Stompeez has stepped up its production and distribution efforts to ensure it will be able to meet this year’s holiday demand with ease. The company works hard to create, promote and sell products that children and parents will love. Stompeez™ stuffs fun and imagination into ordinary slippers for kids. 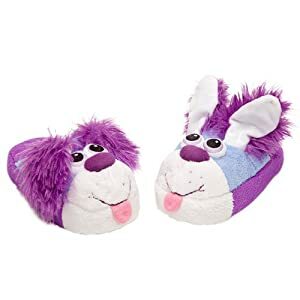 These cute, soft, comfy slippers are a hit at slumber parties, as well as for just romping around the house. Stompeez are available in eight colorful animal characters that pop to life with each step. They come in sizes to fit kids of all ages, from toddlers to teens. With the holidays approaching, Stompeez are affordable and unique gifts at $19.95 plus shipping and handling. Stompeez slippers are ready to ship with a guaranteed delivery date, including in time for the holidays. Stompeez work by stepping on the heel of the slipper. When pressed down the heel compresses a little bulb in the heel that is full of air. This little bulb when compressed sends air to the front of the slipper and causes the stompeez animated face head and ears to flop up. No batteries needed just simple fun with natural wear. we were sent the puple playful puppy and I just know Princess will love them. I have no pictures of her with them yet as they will be a Christmas surprise for her. Oh what a super cool morning it will be when she is stomping all over the place with her Stompeez. Simply can not wait. I personally wish they had them in my size as well they are so super soft and cute would be sure to give warmth and comfort to anyones feet. Want to win a pair of stompeez for someone special that you know? 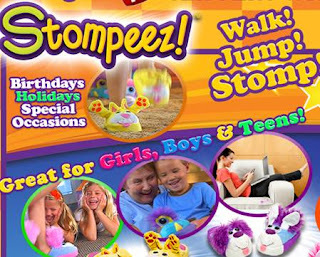 Well you are in luck as the makers of Stompeez would love to give one reader of Annies Home a pair of Stompeez of their own. first visit Stompee and let me know which pair of Stompeez would be your favorite? We would like to thank those that have provided this product for review purposes. 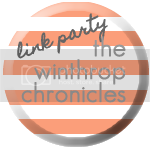 I have wrote this blog post with my own thoughts and was not influenced in any way. 1. N is for NAME: Were you ever tempted to change your name, and if so, which name would you rather have had? 2. N is for NATURE: What do you enjoy most about being in the great outdoors? 3. N is for NEWSSTAND: If you had to purchase a magazine at a newsstand, which title would you be most likely to buy? 4. N is for NICKEL: If a president were to replace one of the current presidents on our coins, which one would you like to see immortalized on our currency next? 5. N is for NOSE: Which aroma from the kitchen is your favorite? 6. N is for NUT: When you’re ready for a snack, which variety of nut is your favorite? 1) Do you ever suffer the blues during the holidays? 2) More than 18 million visitors have toured Elvis' home, Graceland. Have you ever been there? 3) Elvis dyed his naturally light brown locks black. Do you dye your hair? 4) He also insisted his young girlfriend, Priscilla, dye her hair jet black. If your lover asked you to change your hair, would you? 5) Elvis served his country at an Army base in Friedberg, Germany. Have you ever been to Germany? 6) Elvis famously had an affair with Ann-Margret during the filming of Viva Las Vegas. Have you ever indulged in a dalliance with a coworker? 7) Thinking of his movies ... Elvis was, by and large, unhappy with his film career and once said, "The only thing worse than watching a bad movie is being in one." Are you happy with the way your career is going/has gone? 8) Elvis lost "the battle of the bulge" toward end of his life. Are you happy with your weight? 9) As a teenager, Elvis worked as an usher at a movie theater. What was your first job? St. Nicholas Day is always celebrated December 6, 2012. Saint Nicholas was truly a christian saint who lived in the the country of Greece. Saint Nicholas gave up his belongings and followed Christ into the ministry of being a priest and later a Bishop of the early Catholic Church. Famed for giving to the needy people, especially the children. The practice of hanging up stockings originated with Saint Nicholas. As the ancient legend goes, Saint Nicholas was known to throw small bags of gold coins into the open windows of poor homes. After one bag of gold fell into the stocking of a child, news got around. Children soon began hanging their stocking by their chimneys "in hopes that St. Nicholas soon would be there". It wasn't until the 1800's that the spirit of St. Nicholas' life evolved into the creation of Santa Claus. And, this happened in America. Santa Claus emerged (or evolved) from the stories and legends of St. Nicholas. Santa Claus was kind and generous to children. Unlike "St. Nick", Santa Claus is largely a non-religious character. Also a great day to set up a tree to have others bring in mittens to donate. Its cold out there and since December and Christmas is the season of giving its a great time to allow others to give and receive. We were sent a package of sauces. Very tasty if I must say so myself and since I am writing this post I guess I am. The two tasty sauces we were able to taste test were the Portobello Mushroom and Puttanesca. They were packaged very nicely perfect for a gourmet gift for anyone on your list. Let me share with you that the sauces did not dissapoint. Our daughter created a wonderful meal using the portabello mushroom sauce and chicken with pasta. Oh my we were very hapy to say the least The second sauce is on hold until my second daughter comes home for Christmas she is sure to be happy to try the new sauce and we are as eager to taste the what we believe will be amazing sauce. Preheat oven to 350°. To prepare cookies, weigh or lightly spoon flour into dry measuring cups, and level with a knife. Combine flour, 1/2 teaspoon salt, and baking powder, stirring with a whisk. Place butter and granulated sugar in a large bowl, and beat with a mixer at high speed until light and fluffy. Add egg, and beat until well blended. Beat in vanilla extract. Reduce mixer speed to low. Add the flour mixture to butter mixture; beat just until combined. Stir in pecans. Shape dough into a 4-inch round, and cover with plastic wrap. Chill for 1 hour. Roll dough to 1/4-inch thickness on a lightly floured surface. Cut out 40 (2 x 3inch) cookies, rerolling scraps as necessary. Place cookies 1 inch apart on a baking sheet lined with parchment paper. Bake at 350° for 9 minutes or until lightly browned on bottoms. Cool on a wire rack. Dust cooled cookies with powdered sugar. Dust cookies with a bit of powdered sugar for a finishing touch that's not too sweet. Place sugar in a fine sieve, and shake it over cooled cookies. Season the chicken with 1/2 teaspoon salt and 1/4 teaspoon pepper. Put on a baking sheet, skin side up, and bake at 350ºF until an instant-read thermometer inserted in the thickest part of the chicken reads 165ºF, about 40 minutes. Let cool completely. Remove the chicken skin and bone and cut the meat into fine dice. When ready to serve, spoon the chicken salad into the cups. Divide the blackberry pieces among the cups. Sprinkle with sesame seeds and remaining scallions and serve immediately. Have all ingredients prepared and ready to assemble nachos. Pre-heat oven to 350 degrees. In a small saucepan on low, heat refried beans until they are loose enough to spoon onto nachos. On a large oven proof platter, spread out tortilla chips and quickly put a teaspoon of hot refried beans on each chip. Working quickly, sprinkle with onions, Jack cheese, and jalapeno slices. Spoon on chili and top that with Cheddar cheese. Repeat this layering process until ingredients are used up. Place chips in the oven at 350 degrees until cheese has melted. Remove from oven and place on a trivet or heatproof surface. Top nachos with sour cream, green onions, diced tomato and jalapeno slices and serve hot. Combine first 3 ingredients in a large bowl, stirring with a whisk until smooth. Stir in onion, bell pepper, whole-kernel corn, and cream-style corn; mix well. 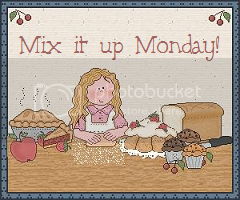 Add muffin mix and black pepper, stirring until well combined. Pour into an 11 x 7-inch baking dish coated with cooking spray. Bake at 375° for 50 minutes or until a wooden pick inserted in center comes out clean. In a large bowl, beat cream cheese and confectioners' sugar until smooth. Beat in the pumpkin, sour cream, cinnamon, pumpkin pie spice and ginger until blended. Serve with gingersnaps. Refrigerate leftovers. Yield: 4 cups. Sometimes we simply want to give everyone something we made for them. Well if this is you and you are looking for a wonderful gift for those little ones in your life why not make homemade playdough for them. Here is a link to a post that I shared earlier here on my blog that has several playdough recipes available. I love to make peppermint bark every year and in fact will be sharing a recipe for it here on my blog during our Christmas 2012 season. But look what I found peppermint crunch puppy chow. Oh my delicious you will have to check it out as well if you kids love puppy chow as much as mine do. For those of you who do not know this is not puppy chow like we would feed the dogs but a delicious snack that everyone seems to love. Drain and rinse your beans very well. Pat dry. Add all ingredients to the food processor, starting with the milk at the bottom. Blend until very smooth, scraping the sides of the blender down every so often. You will need to stir it every 30 seconds or so to get things moving. Garnish with a touch of cinnamon and enjoy! Ice cookies with White Cookie Icing. Allow icing to drip off sides to create melting effect. Let cookies dry for 30 minutes. While cookies are drying, cut about ¼ inch off the marshmallows to shorten the snowman’s head. Use Black Cookie Icing and Orange Sprinkles to make faces on the marshmallows. Once White Cookie Icing has crusted over, adhere marshmallows carefully by adding a small amount of additional White Cookie Icing to bottom of marshmallow. Add remaining decorations with Cookie and Writing Icings. Cookies will be completely dry within 4 hours.